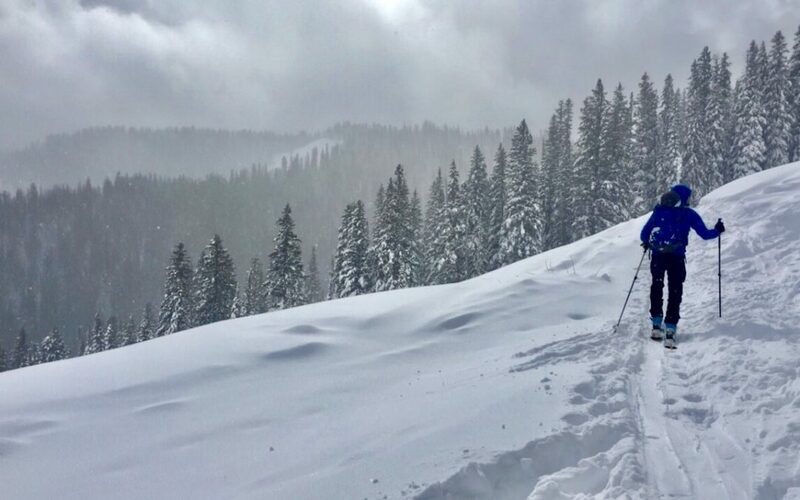 Following the multi day storm of the past week, we traveled out to Avalanche Bowl on the south side of Teton Pass. While the snowpack continues to gain strength and depth we had a few take aways from our observations. The snow pack is getting deeper…depth gives the snowpack an opportunity to insulate itself. Warmer snowpack temps promote an environment for rounding and bonding to occur. There is less temperature variation within the snowpack than there was a few weeks ago. The less variation in temperature means less variability in grain type within the snowpack…and the temps are closer to the freezing point…the snowpack is less likely to facet when temps are similar and warmer. 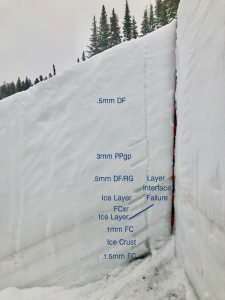 Snowpack tests take more l loading steps to cause a failure…this doesn’t mean that avalanches won’t occur. 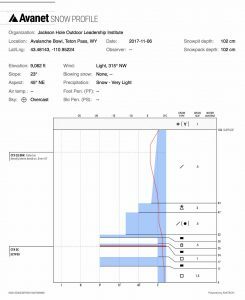 Rather it means that it is taking a greater load to cause a failure or one needs to find a more shallow area of snowpack in order to trigger an avalanche. The snowpack is still considered a shallow snowpack. This means that if the weather changes and we go clear and cold the snowpack still struggles with insulating itself. Cold clear weather + a shallow snowpack = faceting. Not to mention there are plenty of “Snow Snake” lurking in the shallow snowpack, just waiting to end your season early. Weak layers are still present and reactive to testing. While becoming more difficult to trigger the consequences of triggering one hasn’t changed. Do you feel like playing the lottery? If you are engaging in avalanche terrain now you might be playing a game of luck rather than skill. It is early season and the snowpack is still maturing. There are still a lot of unknowns about our snowpack. Specifically how it will react to a new load or how the weather in the short term will affect it. This is the time of the year where I commonly see the most uncertainty regarding how the snowpack reacts. Because of this uncertainty I make my decsion-making easier by keeping it to grassy low angle slopes and do a lot of walking around on my skis exploring and making observations. This ensures two things for me. 1. I will be gaining fitness in the early season when the skiing isn’t all that much to brag about and be ready when it does turn on. 2. I get too see a variety of different aspects and elevations and get my head wrapped around the snowpack. About the only thing to brag about right now is getting out early. And while the turns may be fun, they are not the “best ever” of “best all year”. Anyone who has lived here for a season knows better. Keep it safe, get fit and be ready…as the best is yet to come!